Over the course of the last several years the unity of nature and theology has been forged to uncover vast divine revelations in God’s being and processes. This journey of discovery has led me through the scriptures and traditions of the church that suggest the same God who created the world is also present in it. The Lord provided a system in which creation itself would mature. 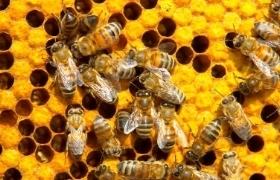 Honeybees, by example, are a part of community or colony. The process by which hive members live helps them to grow. 1500 bees may be born daily in a colony. After two and a half weeks, they are pushed from the hive nursery into the fields to pollinate. The bees born each day push on the ones in front of them. The need for pollen to feed the young emerging bees drives the colony. Just as a need for deeper spiritual understanding drives us. During his time on earth, Jesus used push and pull in the context of his small group of disciples and larger church of seventy. Luke nine and ten speak to the kind of pushing Jesus did with the earliest followers. The twelve disciples and the seventy were encouraged to leave and spread their message in the surrounding towns and villages. The disciples would have never grown into agents of the Lord without Jesus’s compelling message and love for others. They were pulled by the need to pollinate their experience with the gospel. Just as Christian maturity doesn’t exist fruitfully when learning and challenge are absent. Can we discover better how to follow Jesus by observing and interacting with creation? Yes. Creation is a revelation into the nature and systems of God. As a part of the creation, honeybees fly to the top of God’s self-disclosure to humankind. Recall the story of Sampson killing the lion and later a swarm of bees taking refuge in its carcass. The enigma Sampson observes, “Out of the eater came something to eat. Out of the strong came something sweet.” The lion represents despairing people, the bee colony new life and hope. The sacred process of discipleship mimicked in nature by honeybees. Their hive a place of strength and sweetness, process and transformation. One that continues to follow, grow and create. We may find the secret of new hope for the modern church in this ancient ritual of nature as we encourage one another toward a living, accountable faith within community that embraces the push and pull of life. The Holy Bible: New Revised Standard Version. (1989). (Jdg 14:14). Nashville: Thomas Nelson Publishers. Rev. Dr. Matthew Thomas has been a United Methodist pastor for 16 years. He grew up in Central Texas and graduated from Rockdale High School. He earned a Bachelor of Science Degree in Speech Communications from University of Texas at Tyler in 1998. Matt continued his education and earned his Master of Divinity degree from Perkins School of Theology at Southern Methodist University in 2002 as well as his Doctor of Ministry degree in Semiotics and Future Studies at George Fox Evangelical Seminary in Portland, Oregon. Along with a passion for the ministry, Matt enjoys being a beekeeper. Matt is a fourth generation bee man. On his days off you will find him in the bee yard.